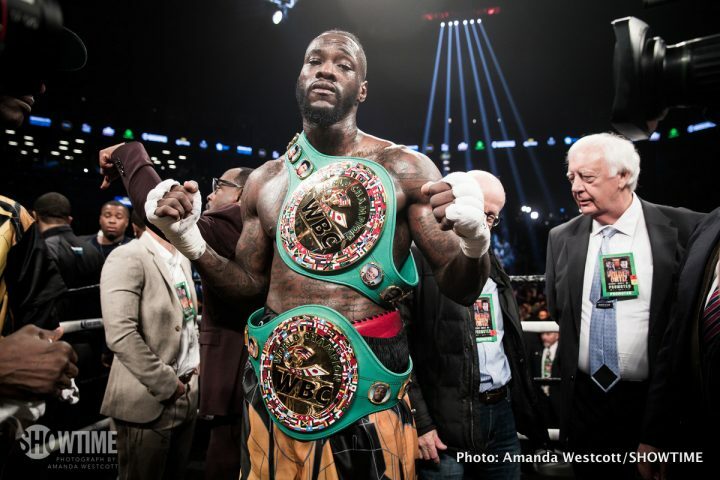 By Allan Fox: Deontay Wilder hasn’t given up on a big unification match with Anthony Joshua despite his British promoter Eddie Hearn standing firm with his flat fee $15 million offer. Wilder believes the fight can happen, but it’ll need to be a 50-50 deal that he’s asking for before it will get done. Wilder (40-0, 39 KOs) will be defending his WBC title in 2018 against likely opponent Dominic Breazeale. Wilder still sees himself getting the fight against Joshua in the future. If Wilder insists on getting a 50-50 deal, it’s going to take some time for the fight to get made. It might require Joshua to suffer two or three defeats before he and his promoter Eddie Hearn of Matchroom Boxing will be open to giving Wilder a 50-50 deal. It’s entirely possible for Wilder to get an even split with Joshua, but it will probably need for things to drastically change in the career of the British fighter. If Joshua loses two or three times, his PPV buys will likely drop off, and that in turn will make him more inclined to give Wilder a 50-59 deal. However, the money for the Joshua vs. Wilder fight won’t be the same as it would be if the fight were to get made now in 2018. “This fight definitely can be made,” Wilder said to Premier Boxing Champions. ”I think the fight will be made. Just that this time around when you come to the table, you’ll have to come correct. I think the fight will be made. Just that this time around when you come to the table, you’ll have to come correct. This will be a 50-50 fight. And that’s the bottom line,” Wilder said. Wilder says he wasn’t given a date or a venue for the Joshua fight. Hearn has mentioned that he wants Joshua to face Wilder on April 13 at Wembley Stadium. Joshua’s promoter Eddie Hearn believes that Wilder will ultimately agree to take the flat fee to face Joshua on April 13. It’s unclear what Hearn knows that the boxing public doesn’t know about Wilder and his management. Hearn now thinks Wilder’s $15 million flat fee should decrease because Joshua’s popularity will surge if he beats Alexander Povetkin on September 22. Joshua’s popularity might increase, but Wilder isn’t saying he’ll take the $15 million that he previously offered to him. If he’s no taking that offer, he probably won’t accept a decrease in the flat fee. th round when he let his hands go and knocked the Cuban fighter out. Joshua may end up losing his IBF/WBA/WBO heavyweight titles before Wilder ever agrees to fight him. Joshua has the popularity and the money to attract the best fighters to face him. In Wilder’s case, he doesn’t have as many top guys looking to fight him. Joshua facing the better fighters will increase his chances of eventually losing to one of them sooner or later. Joshua, 28, might not get past Povetkin, 38, in his next fight on September 22 if he’s not careful. Povetkin is still plenty powerful and capable of doing a job on him if he can land his shots. Wilder’s next likely opponent Breazeale was stopped by Joshua two years ago in the 7th round. Breazeale earned the title shot against Wilder by beating Eric Molina in his last fight last year in November 2017. Breazeale has turned his career around since his loss to Joshua by beating Molina and Izuagbe Ugonoh. “The fans can expect to see me back in the ring very soon,” said Wilder. “We’ve got a great thing going and we’re going to show the world that I am definitely the true heavyweight champion of the world. America has a great champion in Deontay Wilder and once I unify the division everyone can have a chance,” Wilder said. When Joshua and Hearn are ready to give Wilder the 50-50 deal, then the fight can go ahead for Wembley Stadium in London or in the U.S. The fight probably won’t get made by April 13 next year though. It’s going to take Joshua a little longer before he decides to give Wilder the 50 percent split that he’s asking for. The worst thing that can happen to Joshua is for him to get too big for his britches in terms of his popularity. If Joshua becomes too popular, he and Hearn will start offering top fighters less than what they’re willing to accept for a fight with him. Greed can be a bad thing when top fighters decide that they’re only willing to give their opponents 90-10 or 85-15 splits of the revenue for fights against them. In Wilder’s case, he’s not even being offered a split. Hearn only offering him a $15 million flat fee offer, and he’s saying that’s the best he can hope for. “The heavyweight division is too small to have so many champions. It’s a must, it’s a need to have one champion. One face, one name, and that’s me,” Wilder said. It would be good if the heavyweight champions would be reduced to just one. There are currently three champions in Joshua, Wilder and WBA ‘regular’ champion Manuel Charr. There’s a chance in the near future for Charr’ title to be eliminated, but it’ll be up to the World Boxing Association if they want to finally get rid of that extra belt.